Rodgers began shooting for the Hillsdale shotgun team imme­di­ately in the fall. With a spitfire per­son­ality and con­fi­dence, his spe­cialty lies in trap shooting. While he’s shot sporting clays with his dad off and on throughout the years, it would be nearly a decade after that mile­stone Christmas that he would shoot com­pet­i­tively. A tennis player by trade, he put down his racket and pursued a spot on the Grosse Ile high school trap team. Similar to Rodgers, freshman Anthony LaMacchia began shooting around the age of 9 and con­tinued recre­ationally with his dad until his second year of high school. Upon real­izing he could compete indi­vid­ually through the National Sporting Clays Asso­ci­ation, he signed up and began taking lessons at the Car­dinal shooting center near his home in Ohio. But these lessons weren’t enough for him. 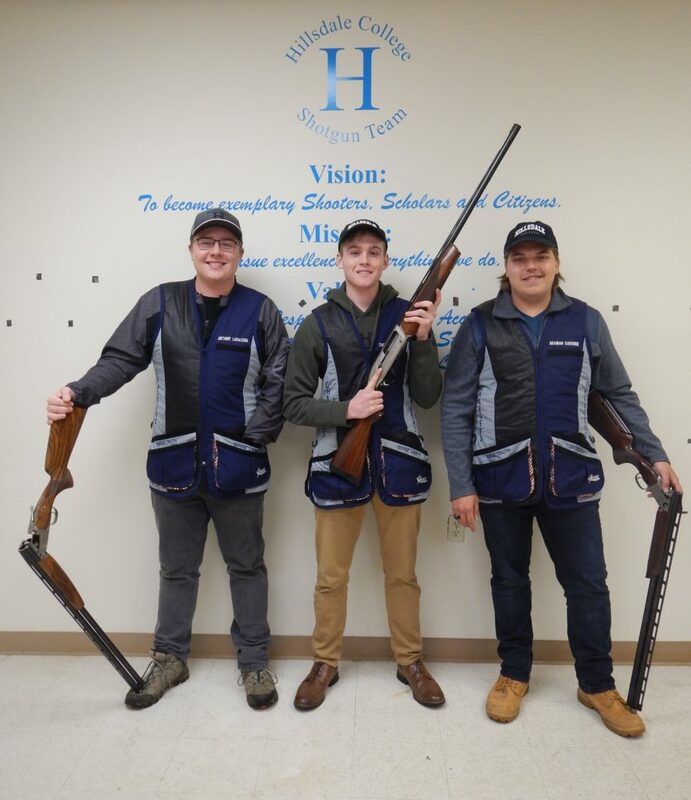 Freshman Brandon Korhonen called him a “student of the game” and LaMacchia sought pro­fes­sional lessons from elite shooting com­petitors the summer between high school and Hillsdale. “Anthony knows the sport of shotgun better than half the people on our team,” Korhonen added. A newer student of shotgun himself, Korhonen first picked up a shotgun during his freshman year of high school. His per­sis­tence during the off-season earned him his first real job at the Multi Lakes Con­ser­vation Asso­ci­ation. As a trapper, he assisted club patrons by pulling clays, fixing and cleaning machines, and honing his abil­ities as a com­pet­itive shooter. His training however, would not prepare him for his most daunting meet. The minus 10 degree weather delayed the sporting clay machines, forcing the team to endure a five hour round. A normal round lasts between an hour to an hour and a half. Despite the weather, the team bonded over the expe­rience. In the presence of his team, Tommy expe­ri­enced his favorite moment of high school shooting. “On the last day of com­pe­ti­tions, I shot 25 straight, then 24 out of 50,” Rodgers said. Rodgers admitted that only the bill of his Disney World hat remained. Both LaMacchia and Korhonen reflected that they still had their hat rem­nants from the first time they hit the 25 straight mile­stone. LaMacchia said his fondest shooting memory was spent with his father. On the field of the Car­dinal shooting center, the two faced off during a round of sporting clays. “It was the first time I beat my dad at a round of sporting clays,” LaMacchia said. Each having unique back­grounds, the shotgun team members had begun to envision what the future would hold for them. LaMacchia is aiming for the NSCA national cham­pi­onship after Hillsdale, as the next level in place where his shooting career began. Korhonen rec­og­nizes the chal­lenge ahead, but hopes to one day hold a spot on the U.S. Olympic shotgun team. Rodgers endeavors to even­tually invest in a nice gun col­lection and enjoy the sport recre­ationally. All three agreed that no matter what path they take pro­fes­sionally, they plan to teach their children about guns and con­tinue the great tra­dition of shooting.